I’ve written before that fast food is loaded with salt, you might as well go to a salt mine and start licking the walls as eat anything at McDonald’s, Pizza Hut, and even Subway which positions itself as healthier but still has much too much salt in its offerings. 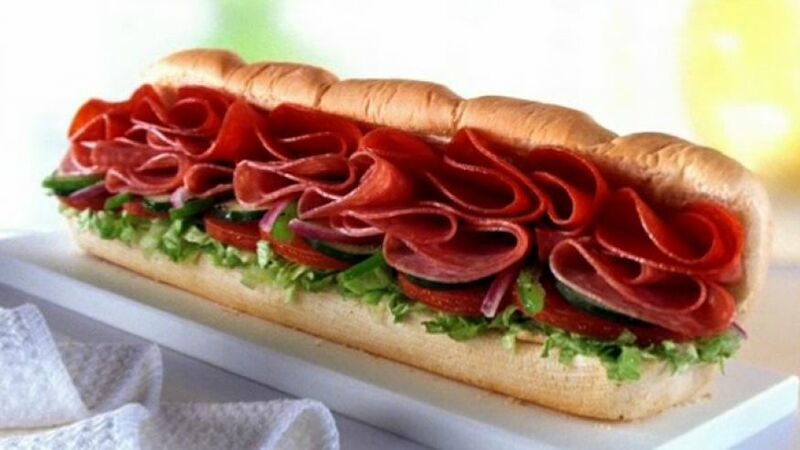 Subway’s spicy Italian, avoid it like a salt plague! So I wasn’t surprised by this latest list of America’s saltiest foods compiled by TheDailyMeal.com and reported by Fox News, among others. Pizza Hut is at the top of the list with a nine inch meat lovers personal pan pizza that has 3,670 mgs of sodium, more than two days worth for someone like me trying to limit my intake to 1,500 mgs a day. Pizza, which I dearly loved, is largely off my menu now because of the salt in cheese and many tomato sauces. I’ve come up with my own low-salt pizza recipe, but even it has a lot of salt for me these days. A lower-salt alternative is to use matzoh for the crust, it’s normally salt-free or low-salt. Second on the list is SUBWAY! The chain that markets itself as healthy! Shame, shame, shame on you Subway. It’s 12-inch spicy Italian has 2,980 mgs of sodium, two days worth. The article recommends as an alternative a six-inch roast beef at 660 mgs, or a 6-inch turkey at 670 mgs. A six-inch is hardly filling, but even those have too much sodium, in my opinion. Three meals at that level would put me over my daily limit. Get the salt out SUBWAY! Or stop marketing yourself as a healthier alternative to other fast food. You can read the remainder of the list here, it’s making me nauseous just to look at it.